AARON MATÉ: It’s The Real News, I’m Aaron Maté. 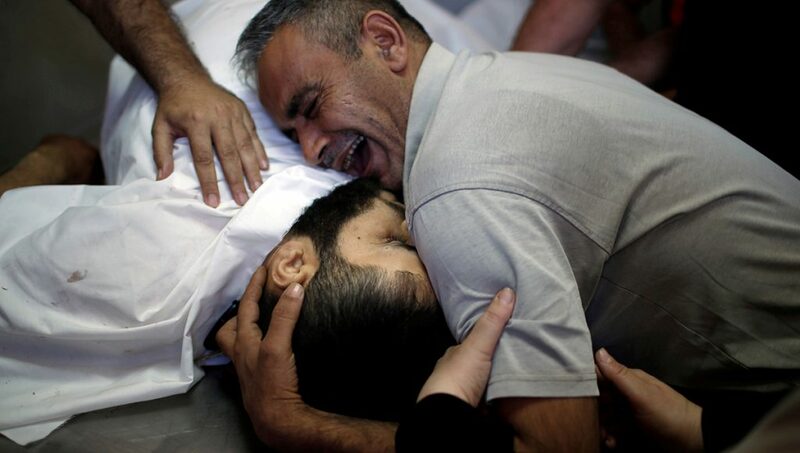 Israel has committed one of its worst massacres of Palestinians in years. At least fifty-two people were killed and more than twenty four hundred wounded when Israeli forces opened fire on protesters taking part in The Great March of Return in Gaza. Israel has followed that up with airstrikes. The attacks come as U.S. officials have gathered in Jerusalem for the opening of the U.S. embassy there. Joining me from Gaza City is Dr. Basem Naim, former Minister of Health in Gaza, and he took part in organizing for The Great March of Return. Welcome, Dr. Naim. There have been shootings of Palestinian protesters throughout The Great March of Return, for the past several weeks, but today was by far the worst. I believe the death toll today surpasses the combined toll from all previous weeks. Your response to what we’ve seen today in Gaza. BASEM NAIM: I think this was a prepared massacre by the Israeli security forces. Because what we have seen is immediately shooting on peaceful protesters without any signs of violence from the Palestinian sides. As you might have seen in the media, thousands and thousands of peaceful protesters, men and women, elderly and children, marched to the fence to call for freedom, for dignified and decent life without, as they say, any excuse. They have started to shoot- more than fifty-two killed and more than two thousand four hundred injured. Many of them are seriously injured. Many of them will, for the rest of life, be handicapped. 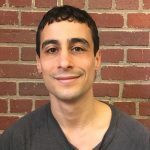 AARON MATÉ: What do you say to Israeli officials who claim that they were acting in self-defense, that Palestinians were trying to cross their border into Israel? BASEM NAIM: First, what does it mean, “cross the borders?” If you live- two million Palestinians live in the biggest open air prison, according to the former prime minister Cameron- or your live in one of the new concentration camps in the twenty-first century, without any access to access to the outside world, poverty above eighty percent, unemployment around fifty percent, ninety-five percent of our water is poisoned and is not suitable for human being, ninety five percent of our beaches are spoiled because of sewage water. Those people are moving towards the fence to call for a dignified and decent life. They cannot continue accepting to die slowly and silently. Second, what does it mean, “fence?” Israel itself, it doesn’t recognize this as a border. They call it “fence” because still they are not recognizing it as a border. And if we will accept this as a border, according to the 1948 ceasefire, we have at least more than two hundred kilometers still beyond the fence, both by Israel between Gaza and the Israeli territories. Therefore, we cannot talk about self defense. Finally, if you- for example, today, fifty-two killed, two thousand four hundred, or more than that, injured. No casualties on the other side. What does it mean, “self defense?” If no one of those who has been killed or injured was a threat, a real threat, for the soldiers, for the snipers, for the tanks, for the aircrafts- you can you can hear mention one of the martyrs of today who has been killed. He is a double amputee, who- he lost two of his legs in the aggression of Israel against Gaza Strip in 2008, and now he has been killed near the border. What can a double amputee man, what can he causing a threat for for foreign army, which is fully armed from head to toes? Therefore, you cannot at all talk about self defense. AARON MATÉ: And he’s not the first amputee to be killed in protests at the border. As well, I believe there were six children killed today in these protests. I mentioned this being one of the worst massacres of Palestinians in years. From what you’ve seen and heard, how does today compare to previous mass killings by Israel in Gaza? BASEM NAIM: I was there for hours, near the fence and within this big mass of people who moved toward the fence, calling, again, for a dignified life, for lifting the siege immediately and unconditionally, again, without any excuse. They have started to shoot- not only snipers, but even tanks started to shoot against civilians. Innocent bursts of peaceful protesters. In one shot, for example, they have killed thirteen young people, including children, in one shot. I think those protesters at no stage were causing any threat to the soldiers or to the army. AARON MATÉ: I want to go to a clip of Jared Kushner speaking today at the ceremony in Jerusalem. Because as this was going on, you had U.S. and Israeli officials and other visitors from around the world gathering for the opening of the U.S. embassy in Jerusalem, and Jared Kushner mentioned the protests in Gaza. JARED KUSHNER: On December 6, President Trump was very clear that his decision and today’s celebration do not reflect a departure from our strong commitment to lasting peace, a peace that overcomes the conflicts of the past in order to give our children a brighter and more boundless future. As we have seen from the protests of the last month and even today, those provoking violence are part of the problem and not part of the solution. AARON MATÉ: So that’s Jared Kushner speaking today in Jerusalem. Dr. Naim, if you could respond to what he says there, that those provoking violence are part of the problem. BASEM NAIM: It is really shameful. If a man who is representing the United States of America, who should defend human rights, democracy, and dignity of people around the world. If he meant describing innocent peaceful protesters, people- two million people. I am not describing this as the biggest open air prison, or jail, or a collective punishment. This is the description of the Nazi state. The United Nations said Gaza in 2020, and maybe earlier, is unlivable. If those people who are moving peacefully- until today, we are talking about more than forty-four days protesting against the occupation near the fence. Israel was not able to have one picture of someone who was using any kind of bombs, pistols, or gun machines, or so on. I mean they were not able to have one photo of a man or a woman who was using real violence. Okay, they might throw stones, they might using- I mean burning tires, and so on. But it is not violence. The violence, the terrorism, is imprisonment of two million people, the siege, bombs in Gaza. This is the real violence, and this is a crime against humanity, by the way. This is not our description. This is the description of a report, who has written the very famous report after the 2008 aggression on Gaza. I mean, the real violence is to besiege two million innocent people and to deal with them as an animal farm, and to prevent them from the free movement. A patient in Gaza has to wait more than seventy days to get a license to pass through Erez, I mean, the checkpoint between Gaza and Israel, for treatment abroad. This is the real violence. Therefore, it is a shameful from a man who is representing the states, which should defend democracy, human rights, and dignity, to to call about- to talk about the Gazans, or the Palestinians in general, as violent provocating people. AARON MATÉ: All right, Dr. Naim, we’ll pause there and come back in part two. My guest is Dr. Basem Naim, the former Minister of Health in Gaza.